The human papilloma virus (HPV) is a common virus that infects epithelium in 10% of the world's population. While most sexually active people become infected, the majority with a healthy natural immunity control their infection. When the infection becomes persistent in cervical mucosa for instance, it is associated with nearly all cervical cancers. Fortunately cervical cancer screening is both sensitive and specific and when accessed has led to significant reductions of this disease. Despite this, cervical cancer still remains one of the leading causes of death from cancer. Oropharyngeal mucosa is becoming persistently infected with HPV in an increasing number of people leading to a potential epidemic of oropharyngeal carcinoma. While only 10% of new oropharyngeal infections persist, those in elderly men who smoke are more likely to do so. Some centres report more than 70% of oropharyngeal cancers are associated with HPV infection, which is different to cancers caused by alcohol and tobacco. Other centres report only a 20% association. Education against high-risk sexual behaviour has been met with limited success. Screening for oropharyngeal HPV infection has been disappointing with a pickup rate of only 40%. Some hope lies in detecting viral DNA in both the saliva and plasma. A HPV vaccine has been available since 2006 but is not yet routinely given to both sexes in many countries. Its effect on the incidence of HPV-positive oropharyngeal carcinomas is currently unknown. Vigilance by dental and medical colleagues in the meantime is essential. Squamous cell carcinoma of the head and neck (HNSCC) has long been regarded as a disease entity having a remarkable incidence worldwide and a fairly onerous prognosis; thus encouraging further research on factors that might modify disease outcome. Squamous cell carcinomas encompass at least 90% of all oral malignancies. Several factors like tobacco and tobacco-related products, alcohol, genetic predisposition and hormonal factors are suspected as possible causative factors. Human papilloma virus (HPV), the causal agent of cervical cancer also appears to be involved in the aetiology of oral and oropharyngeal cancer. HPVpositive squamous cell carcinoma (SCC) seems to differ from HPV-negative SCC. Many questions about the natural history of oral HPV infection remain under investigation. The aim of this review is to highlight the current understanding of HPV-associated oral cancer with an emphasis on its prognosis, detection and management. Oral cancer is an aggressive disease with the propensity for local recurrence and distal metastasis in the head and neck region. Currently, cisplatin-based chemotherapy or concurrent radiochemotherapy is still the first choice to treat the advanced stage cancers, in particular, the unresectable tumours. Unfortunately, innate and acquired resistance to chemotherapy agent greatly limited its effectiveness and often led to treatment failure in these patients. Hence, it is urgent to clarify the mechanisms underlying the development of chemoresistance in patients with oral cancer. In this article, the current understandings on molecular mechanisms of chemoresistance in oral cancer were reviewed, including drug efflux, apoptosis, DNA damage and repair, epithelial mesenchymal transition, autophagy and miRNA. Objective: To investigate the association between the analgesic effect of non-steroidal antiinflammatory drugs (NSAIDs) and sodium channel 1.7 (Nav1.7) expression in the trigeminal ganglion (TG). Methods: Temporomandibular joint (TMJ) inflammation was induced by complete Freund's adjuvant (CFA) in female rats. Ibuprofen, diclofenac sodium and meloxicam were given intragastrically before induction of TMJ inflammation. Histopathological evaluation and scoring of TMJ inflammation was used to evaluate the level of inflammation. The head withdrawal threshold and food intake were measured to evaluate TMJ nociceptive responses. The mRNA and protein expression of trigeminal ganglionic Nav1.7 was examined using real-time polymerase chain reaction and western blot. Results: Twenty-four hours after the injection of CFA into the TMJs, NSAIDs attenuated hyperalgesia of inflamed TMJ and simultaneously blocked inflammation-induced upregulation of Nav1.7 mRNA and protein expression in the TG. However, ibuprofen and diclofenac sodium slightly attenuated TMJ inflammation and meloxicam did not affect TMJ inflammation. Conclusion: Attenuation of hyperalgesia of inflamed TMJ by NSAIDs might be associated with their role in blocking upregulation of trigeminal ganglionic Nav1.7. Objective: To characterise and compare the tensile characteristics after multi-proportional blending, to determine the proper blending ratio for new thermoplastic material and to compare its mechanical performance with commercial thermoplastics. Methods: PETG and PC2858 aggregates were blended in five different ratios. Standard specimens of each ratio were molded and tested to determine their mechanical performance. Then the new material with the proper blending ratio was chosen and compared against commercial thermoplastics. Results: With the increase of PC2858 content, the tensile and impact strength increased but elongation at break decreased. When blending ratio (wt %) was 70/30, the PETG/PC2858 exhibited optimal mechanical properties, with a tensile strength of 63.42 ± 1.67 MPa, and a stress relaxation rate of 0.0080 ± 0.0005 N/s, which exceeded those of Erkodur and Biolon. Conclusion: By blending PETG and PC2858 at the weight ratio 70/30, we obtained new thermoplastic material which outperformed commercial products. Objective: To evaluate the use of platelet-rich fibrin (PRF) in the regenerative therapy of immature canine permanent teeth. Methods: Eight immature premolars of beagle dogs were pulp extracted and cleaned with irrigation, then divided into two groups of empty root canals and those filled with a PRF clot. All of the eight premolars were sealed with mineral trioxide aggregate and glass ionomer cement. Two premolars were left naturally grown as a positive control. The root development was assessed radiographically and histologically after 12 weeks. Results: The radiological findings showed greater increases in the thickness of lateral dentinal wall in the PRF group than in the vacant group. Histologically, dental-associated mineral tissue, connective tissue, and bone-like mineral tissue grew into the root canals independent of PRF clot use. The PRF was able to increase the thickness of dental-associated mineral tissue. However, the vital tissue differed from the pulp dentin complex. Conclusion: Our study demonstrated the feasibility of using PRF-mediated regenerative therapy in pulpless immature teeth for improving tissue repair. 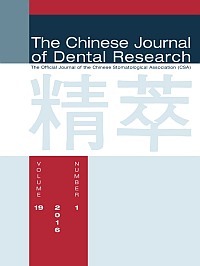 Objective: To explore the effectiveness of comprehensive oral health care to reduce the caries incidence for children with severe early childhood caries (s-ECC) in an urban area in China. Methods: A total of 357 children aged 3 to 4 years old and diagnosed with s-ECC were recruited in this randomised controlled, single-blinded clinical trial for 1 year. Children of two different kindergarten classes were enrolled in this study and randomly divided into a test group (205 children) and a control group (152 children). The test group received comprehensive oral health care, which included: oral health examination, oral health education, topical fluoride application and dental treatment, and the children in the control group only received the oral health examination. The evaluation of the oral health questionnaire for parents was also performed. An evaluation was carried out at the time of recruitment and 1 year later to explore the effectiveness of the comprehensive oral health care model. Results: The differences in decayed teeth (dt), decayed tooth surfaces (ds), filled teeth (ft), filled tooth surfaces (fs) and the ratio of ft /(dt + ft) between the two groups were statistically significant (P < 0.001) at 1 year. The incidence of caries in the control group was higher than that of the test group (P = 0.02). The rate of awareness of oral health knowledge (P = 0.01) and the practice of good diet habits (P = 0.02) by parents in the test group were significantly higher than those in the control group. Conclusion: The present study demonstrated that the comprehensive oral health care program reduces and prevents caries amongst children with s-ECC.